Elijah McCoy made important contributions to the design of railroad locomotives after the Civil War. He kept pace with the progress of locomotive design, devising new lubricating systems that served the steam engines of the early twentieth century. These were demanding indeed, for they operated at high temperatures and pressures. The date of McCoy's birth is not known; various sources give it as March 27, 1843; May 2, 1843; and May 2, 1844. His parents, George McCoy and the former Mildred Goins, were fugitive slaves who had escaped to Canada from Kentucky. At the time, Canada was part of the British Empire, which had abolished slavery in 1833. When the Canadian leader, Louis Riel, launched a rebellion in 1837, the British government used troops to defeat the rebels. George McCoy enlisted with the British force. In return for his loyal service, he received 160 acres of farmland near Colchester, Ontario. Here, he raised a family of 12 children. His father's ties to Britain proved useful as young McCoy pursued his education. As a boy, he was fascinated with tools and machines. At the age of 16, he traveled to Edinburgh, Scotland, to serve an apprenticeship in mechanical engineering. In Edinburgh, McCoy won the credentials of a master mechanic and engineer. Following the Civil War, the McCoys returned to the United States and settled near Ypsilanti, Michigan, outside of Detroit. Young Elijah sought work as an engineer, but met with defeat due to racial prejudice. Nevertheless, he obtained a job as a fireman and oiler on the Michigan Central Railroad in 1870. This was a responsible position, for service as a fireman was a customary prelude to promotion to the post of locomotive driver. Work as a fireman was a far cry from engineering, and it proved to be a physically demanding job. As a fireman, McCoy had to shovel coal into the firebox of his locomotive, at the rate of two tons per hour. He also had to walk around the locomotive and lubricate its moving parts using an oilcan during frequent stops, while it took on water. Locomotives were heavy, and subjected their moving parts to considerable wear. Lubrication was essential for these parts-many of which were applied to railroad axles. These axles carried the full weight of locomotives and railroad cars, and were particularly subject to wear. But engineers had arranged for them to rotate within oil-filled chambers. The rotation of the axle carried oil into its bearing, and the oiled bearing allowed the axle to turn freely while reducing wear to a minimum. However, the direct use of oil-filled chambers did not apply to a locomotive's steam engine, which provided its power. Many parts of this engine operated under the pressure of steam, which acted to push oil away from the moving parts. This made it necessary to stop the engine when oiling it. McCoy saw that he could keep the engine running by using steam pressure to pump the oil where it was needed. Working in a home-built machine shop in Ypsilanti, McCoy devised an invention that became known as the lubricating cup. It relied on a piston set within an oil-filled container. Steam pressure pushed on the piston and thereby drove the oil into channels that carried it to the engine's operating parts. McCoy received a United States patent for this device on June 23, 1872. He took his invention to officials of the Michigan Central Railroad and received their support. Installed on operating locomotives, it provided lubrication that was more regular and even than could be achieved by the old method of using an oilcan during intermittent stops. This proved to be quite useful, for locomotives lasted longer and needed less maintenance. McCoy's lubricating cup proved adaptable to other types of steam engines, which were used in factories and at sea. Versions of this cup became standard components on many types of heavy machinery, entering service on railways of the West, on Great Lakes steamships, and even on transatlantic liners. McCoy left the Michigan Central in 1882 and moved to Detroit, where he devoted a great deal of time to his inventions. He also worked as an industrial consultant, assisting the Detroit Lubricator Company and other firms. The technical demands of railroads soon provided him with further challenges. With the increase of industry and passenger travel, railroad companies needed larger locomotives. James J. Hill, builder of the Great Northern Railroad, introduced monsters that were up to four times larger than their predecessors, along with large-capacity freight cars. Such locomotives burned coal in large amounts, and demanded high horsepower, while using less coal. The solution lay in the use of superheated steam, with high temperature and pressure. Superheating boosted the engines' efficiency, allowing a locomotive to get more miles per ton of coal. It also brought new problems in lubrication. Rather than use oil alone as a lubricant, designers preferred to mix the oil with powdered graphite, a form of carbon. Powdered graphite is soft and greasy, and easily withstands high temperatures. However, because it is a powder rather than a liquid, it can clog an engine. In April 1915, McCoy received a patent for what he called a "Locomotive Lubricator." Within his patent application, he claimed that this invention would permit the use of graphite "without danger of clogging." Hayden cites a letter from a railroad superintendent: "We have found the McCoy Graphite Lubricator to be of considerable assistance in lubrication of locomotives equipped with superheaters. … There is a decided advantage in better lubrication and reduction of wear in valves and piston rings, and as a well lubricated engine is more economical in the use of fuel, there is unquestionably a saving in fuel." In reviewing the life of this inventor, writers and essayists often note that railroad purchasing agents commonly insisted on buying "the real McCoy." Other inventors were offering lubricators that competed with those of McCoy, but these agents would accept no substitutes. Many of these authors assert that the phrase "real McCoy" passed out of the specialized world of railroad engineering and entered general usage, where it came to mean "the genuine article." While McCoy's inventions made millions of dollars, little of this money reached his pockets. Lacking the capital with which to build his lubricators in large numbers, he sold many of his patent rights to well-heeled investors. In return, he was given only the modest sums that allowed him to continue his work. McCoy received at least 72 patents during his lifetime, most of which dealt with lubricating devices, but retained ownership of only a few of them. In 1868, McCoy married Ann Elizabeth Stewart; she died in 1872, at the age of 25. A year later, he married Mary Eleanora Delaney. This marriage lasted half a century, but did not produce children. In 1920, at the age of 77, McCoy joined with investors and founded the Elijah McCoy Manufacturing Company in Detroit, serving as vice-president. The firm manufactured and sold his graphite lubricators, including an advanced version that also lubricated a railroad train's air brakes. Soon afterward, he and his wife, Mary, were involved in a traffic accident. Mary received injuries from which she never fully recovered, and which hastened her death. She died in 1923. For McCoy, the end now approached as well. His health deteriorated and, in 1928, he entered an infirmary. Suffering from hypertension and senile dementia, McCoy died on October 10, 1929 in Eloise, Michigan. 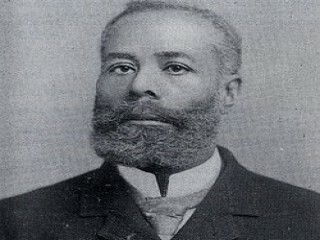 View the full website biography of Elijah McCoy.